This week is the national holiday in China. The Consulate is closed for three days plus a weekend, so I took this opportunity to visit Taiwan. There is a direct flight from Shenyang to Taiwan, flight time is less than three hours. I flew to Taoyuan on Tuesday night, and stayed in a hotel. 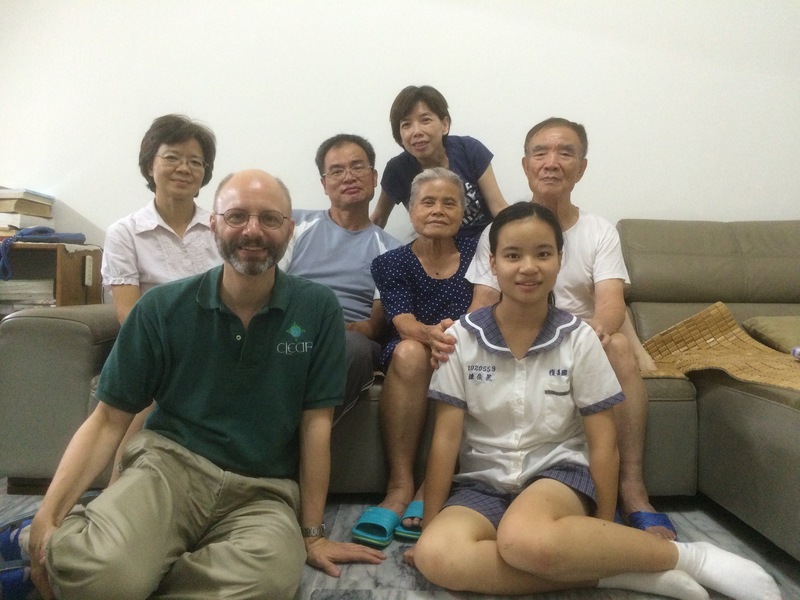 The next day I took the high-speed train down to Tainan, where my wife’s parents and two of her siblings live. It felt like going home. I ate my mother-in-law’s wonderful cooking, and caught up with my in-laws. Last night we went out to a restaurant and ate a huge meal. The dishes never seemed to stop coming. It was great. I also tried a great juice combination: pineapple and passion fruit. If you get the chance to make it, do! Here’s a quick family picture. In case you have trouble picking me out in the picture, I’m the bald white guy in front. Nice picture! I miss everyone so much! Look how big Ariel is getting to be! And so pretty.